By adding up the third device to its M series Samsung today finally launched the mid-range Galaxy M30 smartphone in India. As its biggest highlights, the Galaxy M30 comes with a massive 5,000mAh battery, Display Notch and triple rear camera setup. The Galaxy M30 with 4GB RAM and 64GB storage will be available at a starting priced of Rs. 14,990 while the 6GB RAM and 128GB storage options will cost you around Rs. 17,990. The Galaxy M30 will be available in India exclusively on Amazon from 7th March onwards. The Galaxy M30 features a 6.38-inch Super AMOLED Infinity-V display with support for Full HD+ screen with (2220 x 1080 pixels) resolution. The Galaxy M30 comes with company’s own Exynos 7904 chipset and Mali-G71 MP2 GPU. As I told above, the smartphone comes with 4GB+64GB and 6GB+128GB storage options. Now talking about the cameras, the Galaxy M30 features a 13-megapixel primary sensor and two 5-megapixel sensors along with an LED flash. On the front, it features a 16-megapixel front-facing snapper along with support for face unlock feature. For great music experience,e the Galaxy M30 also comes with Widevine L1 certification to stream HD content and Dolby ATMOS 360o surround sound. For quick unlocking the device, the Galaxy M30 also features a dedicated fingerprint sensor and face unlock feature. The phone support Dual SIM with Dual VoLTE, Wi-Fi a/b/g/n/ac, Wi-Fi Direct, Bluetooth, a USB Type-C port, and a 3.5mm headphone jack. The Galaxy M30 come pre-installed with Android 9 Pie-based One UI and it is fueled by a 5,000mAh massive battery, which has three times faster charging compared to the 5W standard fast charger. Samsung claims that with one full charge, the battery can provide back up to 25 hours for video, 31 hours of talk time and 105 hours of music play time. 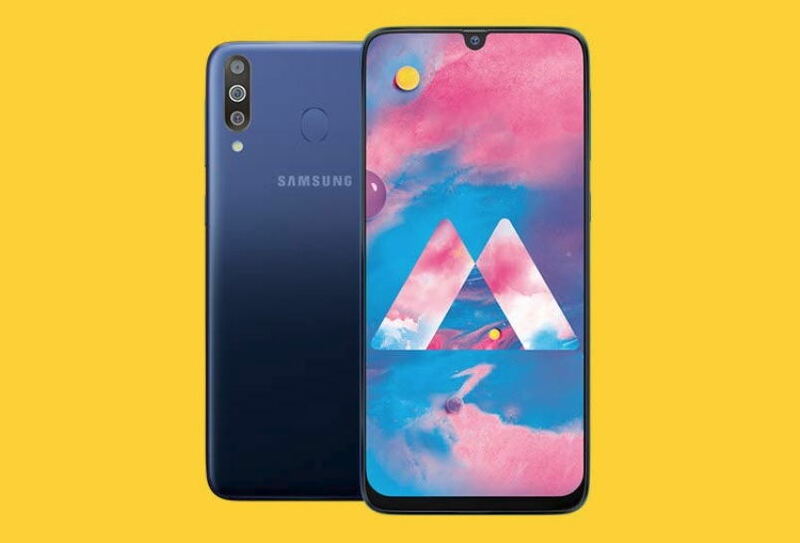 The Samsung Galaxy M30 price in India starts from Rs. 14,990 for the 4GB of RAM and 64GB of internal storage variant. While the 6GB RAM and 128GB storage variant cost Rs. 17,990. For its availability, the Galaxy M30 will be available in India exclusively on Amazon from 7th March onwards.